Bilateral aniridia, partial or complete, is the ocular characteristic of Gillespie syndrome. The iris may be relatively intact but immobile leading to the description in some patients of "dilated and fixed pupils", or congenital mydriasis. The pupillary margin may be scalloped with iris strands to the lens. The pupillary sphincter is sometimes absent and the mesodermal surface missing. The fovea sometimes appears hypoplastic and some patients have decreased visual acuity. Strabismus and ptosis are often present. There may also be retinal hypopigmentation. Cataract, glaucoma, and corneal opacities are not present. Most patients have some degree of developmental delay ranging from difficulties with fine motor tasks to frank mental retardation. Many have a hand tremor, some degree of hypotonia, and learning difficulties. MRI imaging often shows cerebellar and sometimes cerebral hypoplasia. 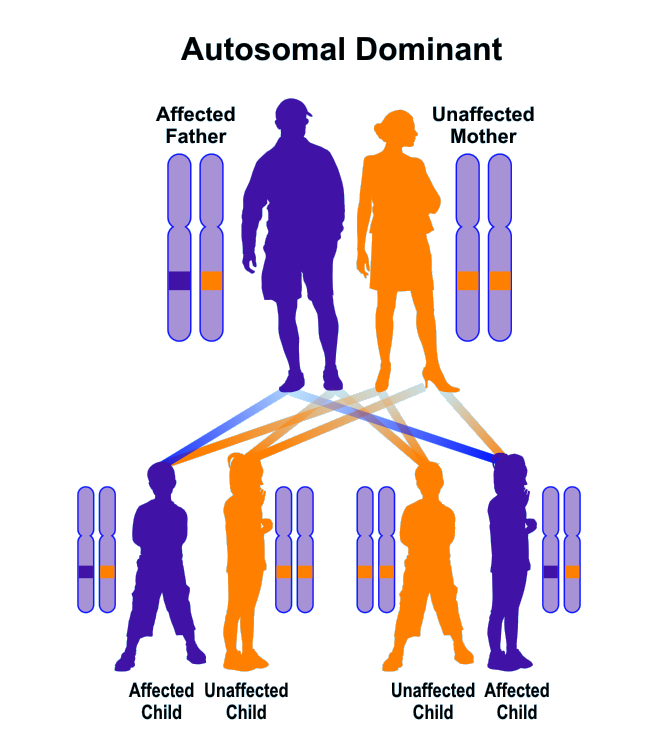 This is an autosomal dominant disorder usually due to a heterozygous mutation in the PAX6 gene (11p13). However, some patients with typical features do not have a mutation in this gene suggesting that there is genetic heterogeneity. Some patients without point mutations nevertheless have defects in adjacent DNA suggesting a positional effect. The possibility of autosomal recessive inheritance in some families with parental consanguinity cannot be ruled out. 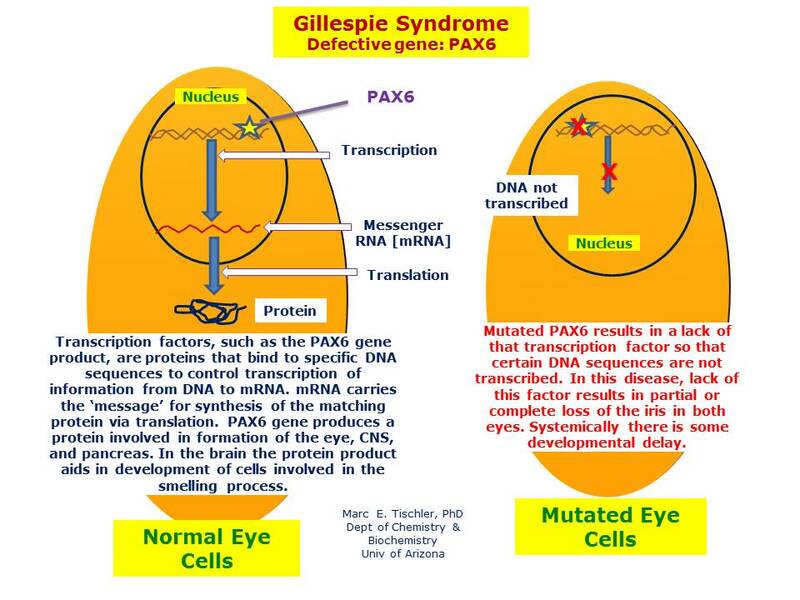 The PAX6 gene plays an important role in iris development as it is also mutant in simple aniridia (106210) and in Peters anomaly (604229). Mutations in the ITPR1 gene have also been identified in Gillespie syndrome. Carvalho DR, Medeiros JEG, Ribeiro DSM, Martins BJ, Sobreira NLM. Additional features of Gillespie syndrome in two brazilian siblings with a novel ITPR1 homozygous pathogenic variant. Eur J Med Genet. 2017 Nov 20. pii: S1769-7212(17)30401-9. doi: 10.1016/j.ejmg.2017.11.005. Dentici ML, Barresi S, Nardella M, Bellacchio E, Alfieri P, Bruselles A, Pantaleoni F, Danieli A, Iarossi G, Cappa M, Bertini E, Tartaglia M, Zanni G. Identification of novel and hotspot mutations in the channel domain of ITPR1 in two patients with Gillespie syndrome. Gene. 2017 Sep 10;628:141-145. Luquetti DV, Oliveira-Sobrinho RP, Gil-da-Silva-Lopes VL. Gillespie syndrome: additional findings and parental consanguinity. Ophthalmic Genet. 2007 Jun;28(2):89-93. Ticho BH, Hilchie-Schmidt C, Egel RT, Traboulsi EI, Howarth RJ, Robinson D. Ocular findings in Gillespie-like syndrome: association with a new PAX6 mutation. Ophthalmic Genet. 2006 Dec;27(4):145-9.